Want To Be A Prophet? Learn To Shut Up! 1. God will tell you people’s secrets. If you operate in prophetic ministry–which requires a deep, strong prayer life–God will call you to pray for people and He will tell you why. through words of knowledge–when random facts come to you out of the blue because the Holy Spirit whispers them in your ear. If God tells you someone’s secrets, you can be sure it’s not for you to go tell people about. A better option is to tell nobody about it, and pray about it first. If God wants you to bring it up to the person, He’ll tell you so – and He’ll give you opportunity to talk to the person with good results. 2. People will tell you their own secrets. Maybe they do it because they know you will stand beside them in prayer. Maybe they need an encouraging word, and they know you’ll be able to hear what the Father is saying. Maybe they just need to vent, and they feel you’re safe. Maybe they can sense the Father’s love in you, and they know you won’t condemn them. I hope all four of these reasons are true for every person in prophetic ministry. At any rate, people will definitely talk to you. So how should you handle that? Honor their trust and keep their confidence. Protect them where possible (unless they are doing something illegal, like abusing a child; in which case go to the police, of course). Speak truth to them, but only as much truth as the Father releases you to speak. You’ll probably have plenty that you could say from your own flesh or opinions, but don’t do it. If the Father doesn’t tell you to say a particular thing, it’s because the person is not prepared to hear it. When people tell you their secrets, you need to know how to shut up because you can’t share their secrets with others AND you can’t dump all your opinions and thoughts on them. Move slowly. Remember to walk in love and honor what they can handle. 3. God will tell you His own secrets! God will give you glimpses of what He wants to do in the future. He doesn’t do it so you can talk about it all over the place. Sometimes it’s not time to release a secret like that. More often, God just needs you to pray. Prayer might be the biggest reason God will tell you His secrets. So, when He gives you a dream, vision, word of knowledge or prophecy about something that He wants to do, start praying like crazy. Find Scriptures that support it and start speaking those into the situation. If you will do so, you’ll be a spiritual midwife, helping to birth the thing the Holy Spirit wants to release. People that aren’t on the same page with what God is doing might even try to hinder it. 4. A good word at the wrong time is still the wrong thing. Intercessors and prophetic people tend to hear God all the time. A problem can occur, however, when they think that NOW is always the time to share what God said. When someone else is lost in worship and God is working them over. Please don’t interrupt them unless you’re the person in authority. Your word is unlikely to be more important than what God is doing. In the middle of a group prayer meeting, when what God told you in your quiet time that morning has NOTHING to do with the flow of prayer. If your word doesn’t flow with the meeting, your word was for you, not for the group, and doesn’t need to be shared. At the end of a meeting or discussion when the meeting is CLEARLY over. You may be disappointed that you didn’t get to share your word, but don’t worry about it. If people are done and want to leave, nobody will listen anyway. Save your word for a time when people can pay attention to it. Ask God when and where, and He’ll give you a time to share it if it needs to be shared. 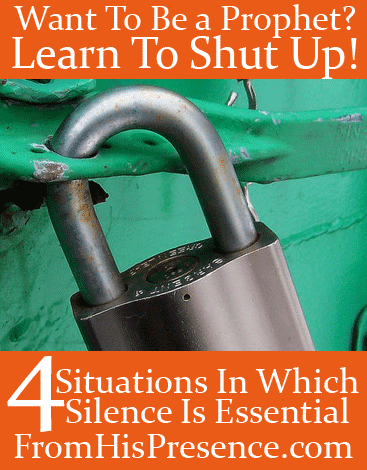 In what other situations is it important to be silent? Share your ideas in the comments below! Image courtesy of Mike on Flickr. I could tell you who, but then I’d have to… Oh wait. This isn’t that kind of blog. 😉 Yeah, I agree. I find that the hardest thing for me to do is to zip my lips if I have something to say. Thank you for sharing, and thank you for reading! Have a wonderful day! Yes Ma’am! This is awesome. Thank you so much for this teaching and exhortation Jamie. So glad it helped, Rejitha. Father can make all things new! Read and was blessed by this lesson again! This is good all day – every day – infinity. Praise Jesus for you, Jamie! Wow..Thank you so much for this teaching Jamie. I have had revelations about people and would tell others as well,but regret afterwards. I would wonder why..now I know silence is golden until Holy Spirit allows me. Yes; otherwise, it’s usually gossip and/or slander, character assassination, etc. Wonderful post! Thank you! I want to be a prophet, I want to be a seer, but where do I start?